Well, here we are with only one more sleep ’til Christmas 2010. It came extra quickly this year didn’t it? The line up at the till was twelve heaping buggies deep, but the two express lanes were worse, with twenty people or more each looking like they’d taken “fifteen items” as a minimum suggestion not a rule, so Candice stayed where she was. The last Friday just before Christmas—what a stupid time to hit a grocery store! As she stood waiting with her small basket of milk, eggs, bread, and frozen pizza—meant to hold them over to her “real” shop later in the weekend—she perused the droves of people milling about, shopping, laughing, fretting. It was kind of nice to stand still. A waste of time, obviously, when she had so many things to do, but kind of an enforced break all the same. She sipped the Eggnog Latte she’d splurged on and felt quite decadent as she played a game she hadn’t in a long while. Who was that person, what did they do, how were they feeling? What I like about the scene (that will no doubt change immensely as it’s first draft stuff) is that even feeling stressed and cranky, Candice finds a few seconds of calm inside herself and even daydreams a bit. And that’s my wish for you this Christmas—not that you’ll be stressed or cranky at all, but that you’ll find some time to sneak away—whether you’re in a crowded place or not—to observe and ponder and feel just a bit decadent as you do so. Facing Fire by kc dyer – Win a free book! It’s an exciting day for me — and a bit of a different type of blog post from me to you. Several years ago now, I had the pleasure of meeting this crazy-fun, spontaneous author, kc dyer, in Surrey at SiWC. kc dyer’s books include The Eagle Glen Trilogy (Seeds of Time, Secret of Light, Shades of Red), Ms. Zephyr’s Notebook, and A Walk Through the Window – the first novel in a new series. Its sequel, Facing Firing, was just released this week and her main character Darby is gallivanting about the Internet, doing guest blogs to stoke flames of interest for this latest tale. Anyway, without further ado, here’s Darby on Facing Fire and how journal writing can spark a great story. p.s. Please comment so I can enter you name in a draw for a free copy of Facing Fire! While we’re on the subject of polar bears, I’d better start by telling you something about myself. I don’t generally pursue polar bears in my spare time, but after the past year or so it’s become pretty apparent that I do have a weird talent for . . . time travel. This month, as you know, I’m celebrating the release of my new book, FACING FIRE, and it’s got me to thinking. The story tells what happened after the magical summer that you may have read about in A WALK THROUGH A WINDOW. But before I got to the walking-through-windows and slip-sliding-through-time bits, I had to do a little writing. In the first story, my teacher gave us the dreaded summer journal assignment. At first I was hugely upset –- I wanted to spend my summer skateboarding down Yonge Street in Toronto, not writing my deepest, inner-most thoughts into a lame coil notebook. But you know, after the summer I had . . . well, let’s just say I was pretty glad to have kept a record. So, in a way, I guess you can call me a writer. And if I thought things were weird in the first book? Well, they got a whole heckuva lot weirder in FACING FIRE. Not to mention this little problem at school . . .
Or better still, how ’bout winning a copy as a prize? If you comment on this post, Ev will put your name into a draw to win a free copy of the new book – FACING FIRE. And if you link to this post somewhere else (like in another blog, or on Facebook post or even a tweet) we’ll put your name in for the draw for BOTH of my books. So comment away! And hey, Ev? Thanks for having me. I think you should start, y’know. Tell us all about what goes in YOUR writing journal! I started a new job April 27 and as I was driving home from work the first Friday, reflecting on the week’s training, the thought occurred to me: I’m not a kid anymore. I attribute this change to a myriad of ongoing experiences. Running my own business has shown me that I’m competent in a variety of areas. Writing has given me a safe place to vent and to explore, while providing a sense of fulfillment that makes “job satisfaction” less critical to me. I want to do well at work, because that’s my personality type, but my job is a job, not my life. Aging itself, which has lent perspective about what to concern myself about. This “not a kid anymore” strain of thought was lovely and apropos as it occurred on the eve of my 38th birthday and coincided with the realizations my main character has made lately. I’m fascinated by how changes in our personalities or general approach to life can sneak up on us, catching us almost unawares—like until we’re put into a position where our personality/beliefs, etc are tested, we’d never know they’d deviated. While my change in self-perception/outlook was positive, sometimes these sneaking deviations from formerly held views and approaches to life are negative. The person who wakes up on his 30th wedding anniversary and realizes he doesn’t love his spouse (or that she has never loved him). The person of religious faith who, after years of devotion, worries that their faith is baseless. The fifty-year-old who realizes now that their children are fully grown that they’d made the same serious mistakes raising them that their own parents did . . . The most powerful part of these inner revelations is not the actual change in our thinking, but the awareness of our change and what we go on to do in light of it—how it affects the way we live and the way we relate to people in our lives. The most interesting novels to me show characters grow and develop (and regress!) over time—they explore the twisty path of human experience, not just event. I hope your characters have pivotal moments—large and small—in their interior lives, perhaps kindled by action happening in the story, perhaps intrinsic to, thus feeding the story. It doesn’t matter which comes first—the plot, then the characters’ change and growth or a character’s change that leads to some explosive plot, but inner change has to be there. We shouldn’t create static characters, because humans aren’t static. Even in the silliest, most simple ways they change, grow, discover—and are changed by noticing that they do. So what do you think? Do your characters change in big and small ways through your story or series? Do you agree that it’s important? I’m a bit of a soup addict. Whenever I’m stressed, inching toward depressed, or feeling blue about something, I make soup. Chopping and grating, bringing to a boil, simmering. . . tasting. The steamy aromas of mingled garlic, onion, occasionally ginger . . . Mmm. There’s something Zen about cooking in general, and making soup from scratch especially. And like my aunt says, even if you can’t cook, it’s hard not to make great soup, so long as you use quality ingredients. It will sound corny, but I think she’s right only to a point. Something of yourself has to go into the pot too—your love, your affection, your hope, your well wishes . . . 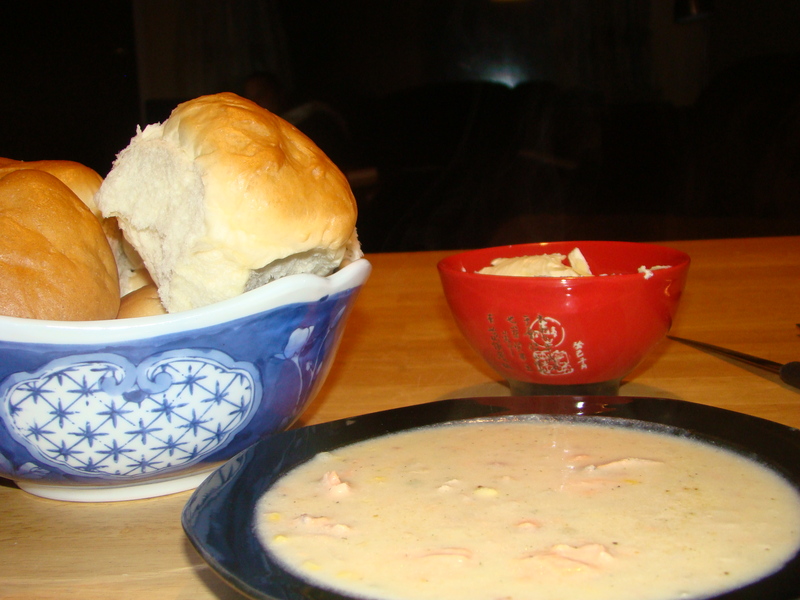 Yesterday I made salmon chowder (from a Spring my son caught last summer) and while I consider myself a decent cook, I impressed even myself. I was wowed by the scrumptious creamy, savoury results. I used a recipe from Allrecipes.com, then modified it (as is my style) ‘til the concoction in my pot could never be recreated using the recipe card sitting on my counter. As I cooked (and tasted! ), my mind wandered all over the place, but especially back to the novel that I’m working on. In the last scene, written just shortly before I started dinner, my MC was making soup. And there were soup references in my last novel too. The books aren’t the type that will be marketed at gourmands, with recipes in the back (though I do love those). In fact, the scenes are very brief—I don’t know if a reader would even consciously remember them, but they are, I realized, symbolic. Soup is the epitome of comfort food, belonging and home. Every culture has its own variations of the dish, and while soup can be whimsical, there’s nothing trendy or passé about throwing things in a pot to simmer and blend all together into something, always a bit different, always good. Soup, regardless of its name, is as old as the human race. And what does my character want and crave, but not have? Family. A sense of belonging. A home. Food and eating of all kinds (not just soup!) has weighty (no pun intended) positive and negative connotations for the character as an individual and within his/her relationships. What your character eats or doesn’t eat, and the way they eat—standing over the kitchen sink, or with wine and candles even when alone—says a lot about their personality, their desires, their family background, their financial situation and so much more. The way characters prepare food (or don’t) also shows who they are, how they perceive themselves, and how they want to be perceived by others. I don’t know what this says about me, but when I make soup, I feel like a good mom. What does your character feel like? A house elf? A slave? A fortunate soul to be able to cook when so many people in the world can’t put food on the table? We shouldn’t make every scene about drinking tea or buttering fresh baguette, but we should remember that all humans everywhere eat—or need to eat—and have strong feelings about food. Sneaking in small sensory details about this primal need can be a great way to reveal information about your character. So how about it? Have you ever considered what the food references in your story might be saying about your characters? Would adding some details about eating somehow enhance your characterization?